Los Angeles— Grupo Comercial Chedraui – the parent company of El Super grocery stores in the U.S. – has reported another quarter of disappointing sales growth. The company’s growth performance has been weakened by negative same store sales (SSS) in its El Super grocery store segment as reported over the past year, a period which coincided with the consumer boycott in the U.S. 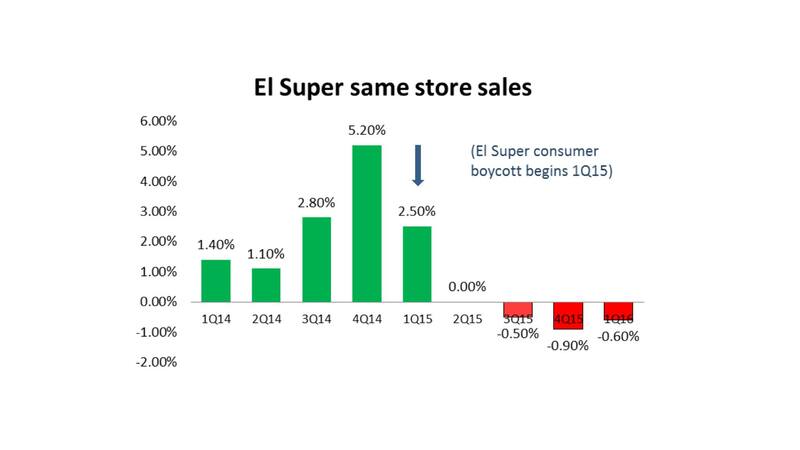 Same store sales at El Super stores in the U.S. declined for the fifth consecutive quarter since El Super workers and their union, UFCW, launched a consumer boycott of the grocery chain in December 2014. The Boycott was targeted at the Company’s unfair labor practices, its failure to negotiate in good faith and its failure to reach a fair agreement with its workers. The El Super sales decline during the first quarter of 2016 is significant because the company added four new stores in the period just prior to the last 12 months. The four new stores—two opened in the 4th quarter of 2014, and one each in the 2nd and 3rd quarters of 2014. The first quarter 2016 new store benefit represents the largest new store boost to El Super’s SSS in more than a year. Inclusion of these new stores leads to an expectation that U.S. SSS growth would increase, not decline. Recently available U.S. government data on labor hours during 2014 and 2015 at 17 El Super stores in California and Arizona, eight of which were subject to active pickets as part of the consumer boycott during 2015 and nine of which were not, reveals an interesting pattern. The data – maintained by El Super in compliance with the Occupational Safety and Health Administration (OSHA) – shows that El Super cut labor hours at all stores in our sample which were subject to active pickets in 2015, while hours for the non-picketed stores in our sample were relatively flat and showed no consistent pattern. El Super workers have reported some store managers blamed the consumer boycott for poor sales and resulting in the need to make cuts in hours, and further undermines the company’s denials that the boycott has had a negative effect on sales. The Union has continued to seek to hold the Company accountable for its actions with respect to negotiations through all legal avenues. The reporting of negative sales growth at El Super stores coincides with an April 28, 2016 ‘Formal Settlement Stipulation’ between El Super, UFCW unions that represent El Super workers, and the General Counsel of the National Labor Relations Board. A formal settlement contains a direct order from the National Labor Relations Board itself and is very rare. Consistent with NLRB law and policy the formal settlement can serve as evidence that El Super is a regular violator of labor law and that EL Super has a proclivity to violate the Act. (b) Failing or refusing to provide UFCW with information that is relevant and necessary to their roles as the unit’s bargaining representative. (c) Failing to timely furnish the Unions with information that is relevant and necessary to their role as the unit’s bargaining representative. (d) In any like or related manner interfering with, restraining, or coercing employees in the exercise of their federal labor rights. (a) Bargain collectively and in good faith with the UFCW. (b) Provide UFCW Local 770 with a seniority list for unit employees at its Arleta, California store that includes employees’ dates of hire, position titles, rates of pay, and whether they are classified as full-time or part-time. (c) Provide the UFCW with the a seniority list for all unit employees that includes employees’ full names, last four digits of their social security numbers, hire dates, wage rates, seniority dates, and full-time/part time statuses. El Super workers have been fighting to win a fair union contract from El Super since September 2013. The information the company was ordered to provide is essential to formulating contract proposals that address UFCW El Super members’ longstanding goals of winning fair pay and more guaranteed hours for full-time workers. El Super is managed by the Paramount, California, based Bodega Latina Corp. El Super’s business model focuses on serving first, second and third-generation U.S. consumers of Mexican descent. Grupo Comercial Chedraui (Chedraui) is Mexico’s third-largest retail chain with over 42,000 employees in 224 stores throughout the country. Through its 84.85% ownership stake, Chedraui controls California-based Bodega Latina Corporation, which does business as the El Super grocery chain. During 2015, El Super opened five new stores – bringing its total to 54 locations. It has 46 stores in California, five stores in Arizona, and three in Nevada. Nearly 150 brothers and sisters at Main & Vine in Gig Harbor, Washington, were granted recognition to be represented by Local 367. Main & Vine is a new store concept from Kroger that focuses on fresh local produce and high quality prepared foods. The Gig Harbor Main & Vine is the first shop that Kroger has opened under this new brand. Their contract vote was held on March 17, and passed by an overwhelming majority. Becoming a part of UFCW Local 367 was exciting to everyone who works at Main & Vine because it meant an instant improvement in both wages and benefits. As Kroger opens more Main & Vine stores throughout the country, this effort by Local 367 will help to reinforce the message that being a part of the UFCW union family really does lead to a better life. Sometimes the smallest gestures can make the biggest difference. 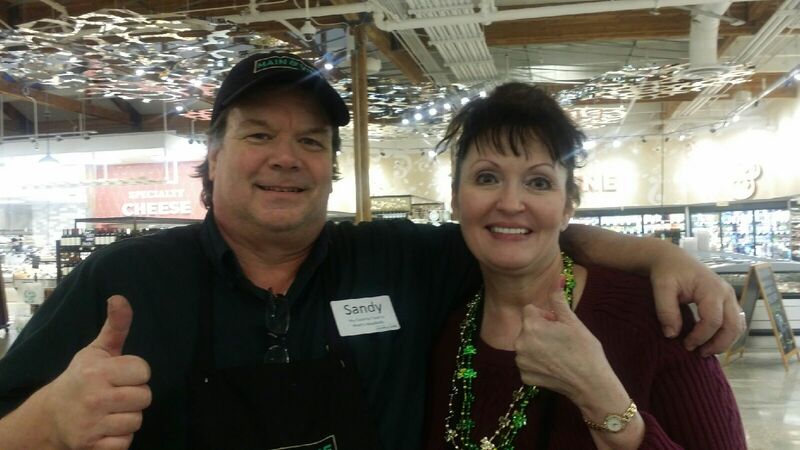 It’s not easy to be personable, upbeat, and polite every day and all the time doing any job, but that’s what’s expected out of cashiers to give great customer service. 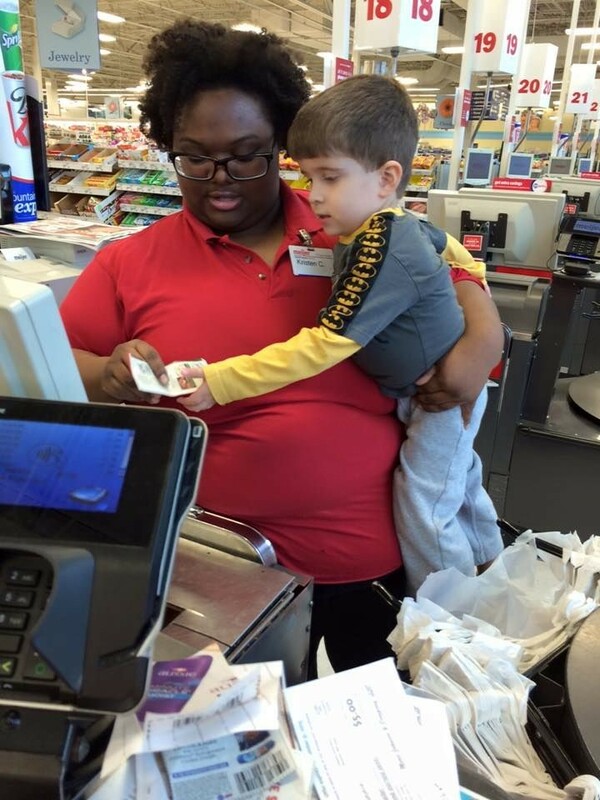 However, Kristen Clark, a UFCW Local 75 member, who works as cashier at an Ohio Meijer grocery store went the extra mile with customer Kimberly Grandinette and her 3 year-old son Paul proving that a small act of kindness can have a great effect on more than just those who shared the moment. Last Sunday, while checking out her items, Kimberly conversed with Kristen about her family’s recent hardships that had begun to have effect on 3 year-old Paul. The two continued to chat while Kristen rung up the rest of Kimberly’s items until Paul asked if he could join Kristen in ringing up the rest of his mother’s groceries. Kristen then picked up Paul and held him while he helped scan the rest of his mother’s items. Kimberly Grandinette detailed the story in a Facebook post about how much that act of kindness meant to her and her son Paul. “She made him feel like a million bucks. He skipped out of the store with a smile on his face,” the mom wrote. “Thank you, Kristen, for making my son’s day (and my day!) a bit brighter.” Since that Sunday, Grandinette’s Facebook post has touched the lives of so many others and gathered more than 144K likes, 10K shares, and 3.6K comments on Mejier’s Facebook Page. Although Kristen admits that she was initially surprised by how much attention the story received, she said that way she interacted with Kimberly was ordinary in her day’s work. “I try to engage with my customers,” she said. “I like to get to know people. Even if it is just for three minutes” as they’re checking out. 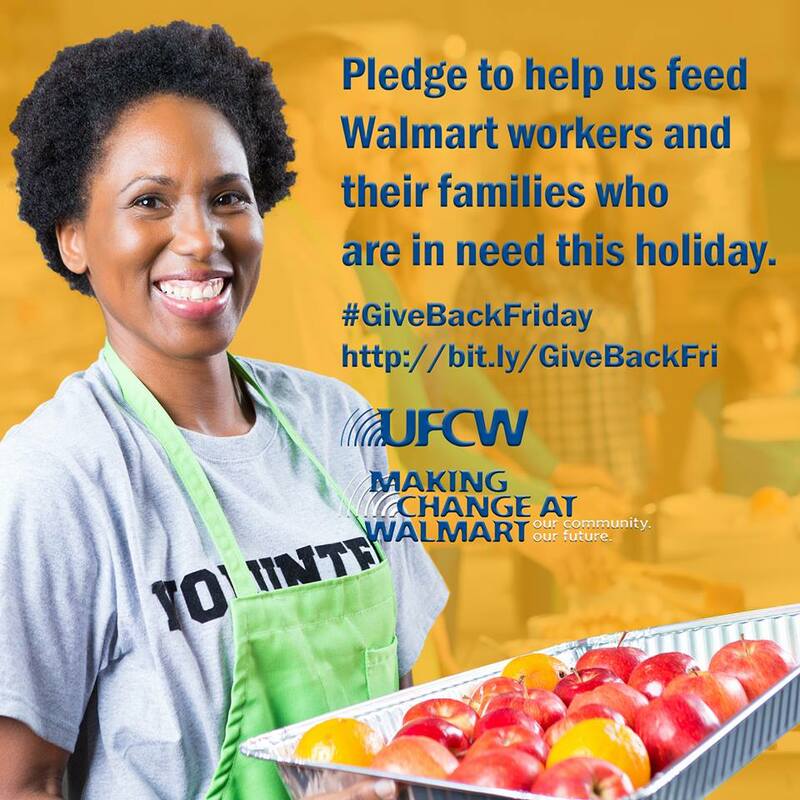 Yesterday, the UFCW and Making Change at Walmart officially released a series of holiday actions against Walmart, beginning with a call to action during the week leading up to Black Friday called the “Give Back Friday” initiative. Give Back Friday is all about helping the hundreds of thousands of hard-working Walmart employees who are paid so poorly that they must rely on assistance from food banks and use food stamps. During this entire Black Friday week, Making Change at Walmart, our progressive partners, and countless other organizations will be hosting food drives in cities across the country the week leading up to Black Friday with a goal to feed 100,000 Walmart workers and families though the holidays. Locals Unions are asked to share and sign the pledge to donate to a food drive or a food bank in their area. 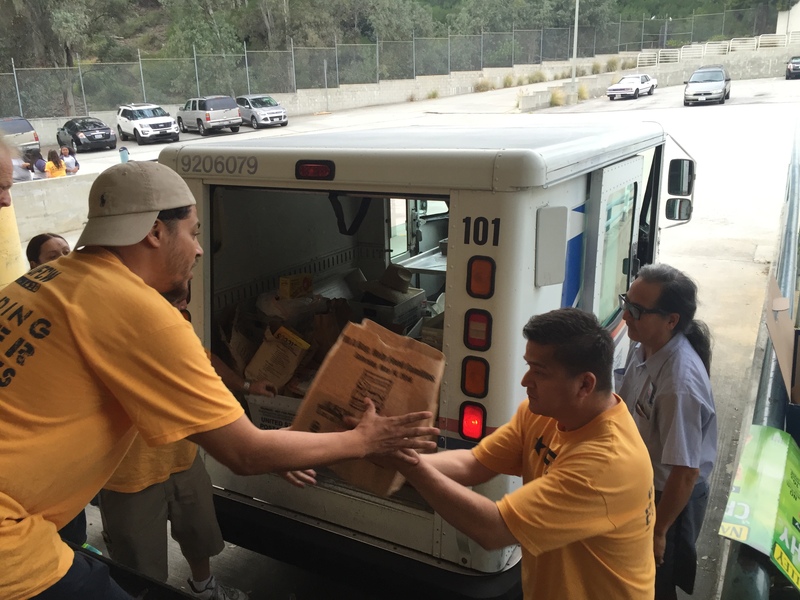 By working together, we can help Walmart workers and their families. Help us feed 100,000 Walmart workers and families and make sure to post about it using the hashtag #GiveBackFriday and #feedhungryworkers. Together, we can make a difference in the lives of over 100,000 families because no one in America, especially the men and women who work for one of the richest companies in the world, should have go to hungry this Thanksgiving and through the holidays. It’s not easy to be the first person to arrive at our Union’s General Membership Meeting. It’s even more difficult to arrive eager, excited and alert after riding a bike through the rain for a few miles. But rain or any negativity has never stopped Peter Hoffman, and won’t stop him from riding to any meeting, regardless how hard the commute may be. Peter Hoffman is one of the most dedicated, positive union members in UFCW Local 1500. Peter lives with resounding positivity and pushes solidarity amongst all of his coworkers. “If everyone can stick together we can do amazing things. When people think differently about the union than I do, I tell them why I like the union so much, I’ve been around for a while, I know and have seen people get in trouble, and the union is the only one there to help you,” Hoffman said. He also enjoys raising funds and awareness for various charities like Making Strides Against Breast Cancer or the Leukemia Lymphoma Society. Peter genuinely enjoys helping customers at work, and talking to them about his union. “The best thing I’ve learned in life is to never say never, and don’t give up your belief in yourself. That’s the most important thing in life,” Hoffman said. 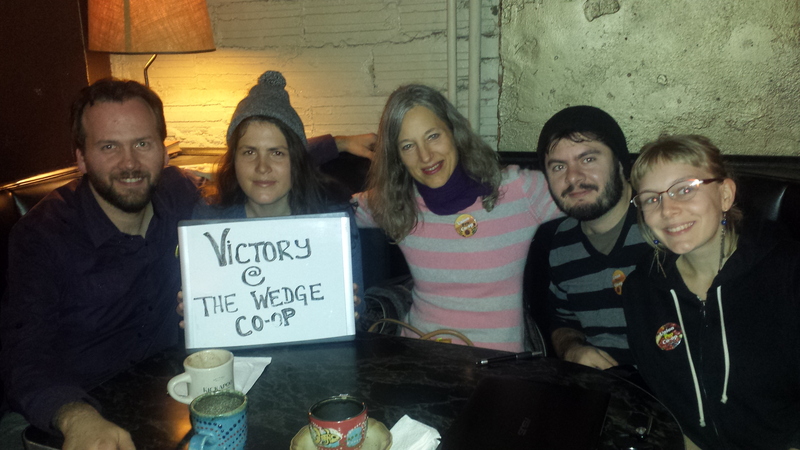 Last Monday, workers at Wedge Community Co-op in Minneapolis voted to form a union with UFCW Local 1189, making it the first co-op grocery in the Twin Cities area, home to many co-ops, to unionize. A union drive at the Wedge Table, a cafe and market in the area that is also owned by the Wedge, is still ongoing. As we continue to celebrate Hispanic Heritage Month, we’re highlighting the story of Fermin Rodriguez, who has bravely stood up for his coworkers and their collective union rights. Since September, 2013, Fermin and his fellow workers had been working without a contract because El Super refused to bargain with them even after the workers fought off the company’s decertification attempt to take away their Local 770 union representation. In response, the workers launched a boycott to protest the company’s unfair labor practices at their store. Since then, workers like Fermin have continued to speak up about what the company is doing, and have gained support from other workers and community members from far and wide. In late July, Federal Distict Court Judge George King granted the National Labor Relations Board’s (NLRB) request for a rare “10j” injunction to stop El Super’s unfair labor practices and immediately remedy their unlawful treatment of workers. In the face of El Super’s coercive and threatening conduct designed to silence workers, Chief Judge George H. King issued the significant “10j” injunction, ordering not only the immediate reinstatement of Fermín, but the restoration of workers vacation accrua which El Super had taken away. The Company also conceded in the face of these actions that it would return to the bargaining table. 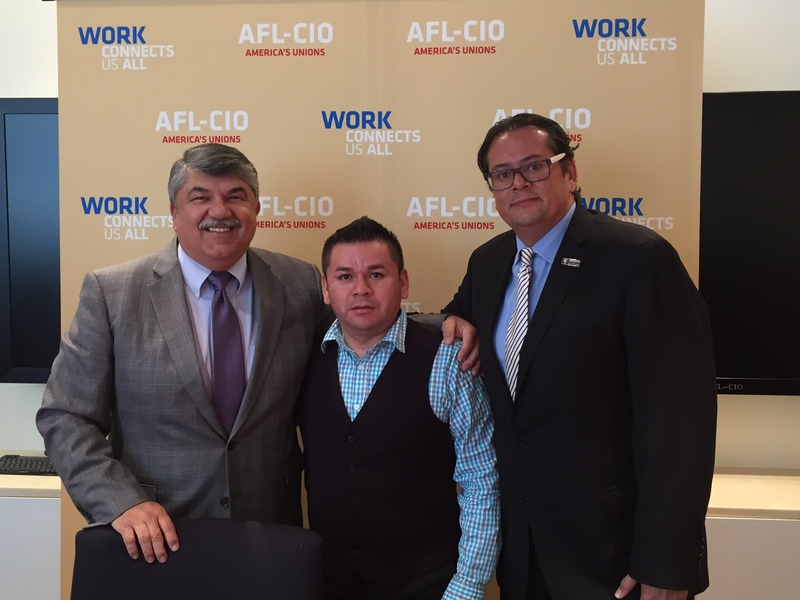 To speak out about how he and his coworkers are engaged in a campaign to stand up for worker rights, Fermin came to Washinton, D.C. this week to #StartTheConvo at the White House Summit on worker voice. On Oct. 7, the White House is holding a summit with leaders in the various movements to improve the lives of working people across the country, with a focus on how to make sure that economic growth is broad-based and that workers share in the benefits they help create with their labor. Until the summit begins, we’ll be highlighting the stories of workers and their struggles to make sure their voices are heard on the job. Today, we take a look at Lydia Flores. Flores is a 37-year-old single mother of three who works as a cashier at union El Super market in Arleta, Calif. She and her co-workers have been fighting for a new contract for more than two years in the face of a campaign by the company to undermine the workers’ desires for fair working conditions and a voice on the job. I pay the mortgage and my car and my utilities—and the rest of the bills have to wait. Sometimes I work 32, 36 hours. The 40 hours are not guaranteed. When Flores speaks up about anything at work, she says that she is met with hostility and disdain. Other workers at El Super have made similar complaints. Flores knows that coming together with her co-workers can make positive change. She is a member of the United Food and Commercial Workers (UFCW) Local 770, a shop steward and a member of the union’s bargaining committee. El Super employs low‐wage and predominantly Latino workers. The workers at the union stores were covered under a contract with El Super that expired on Sept. 27, 2013. For more than a year, the unions and the worker bargaining team sought to bargain to improve their working conditions. In September 2013, El Super imposed what it called its “last, best and final” offer, which did not address the workers’ concerns and provided for less paid sick leave than is currently mandated by California state law. 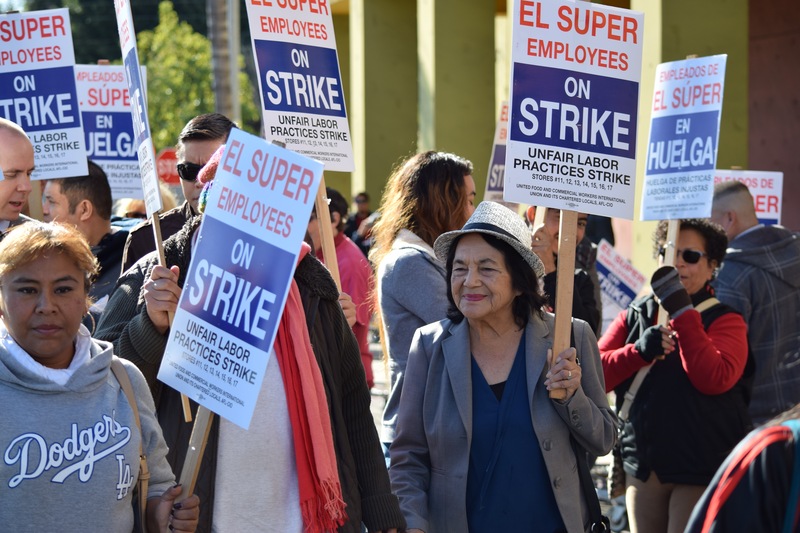 On Dec. 12, 2014, El Super workers voted resoundingly to recertify the union and demanded the company return to the bargaining table, a request which El Super rejected. El Super employees and the UFCW launched a boycott in December 2014 to protest the company’s actions. The union’s boycott lines have turned away more than 100,000 prospective El Super shoppers. In the face of the boycott and after the NLRB issued complaint and sought a 10(j) injunction in federal court regarding the company’s unlawful refusal to bargain, the company agreed to return to the table. El Super recently agreed to bargain for the first time in more than a year. El Super is managed by the Paramount, Calif.-based Bodega Latina Corp. There are 50 El Super locations in Southern California, Arizona and Nevada. Bodega Latina Corp. is 81.4% owned by Mexico-based Grupo Commercial Chedraui (Chedraui). Chedraui operates 211 markets in Mexico. It is Mexico’s third-largest retailer. In January 2013, Forbes estimated the personal wealth of Chedraui’s chairman of the board, Alfredo Chedraui Obeso, at more than $1 billion. That year the company made $5.1 billion in revenue. The El Super stores make up more than 20% of Grupo Chedraui’s income. 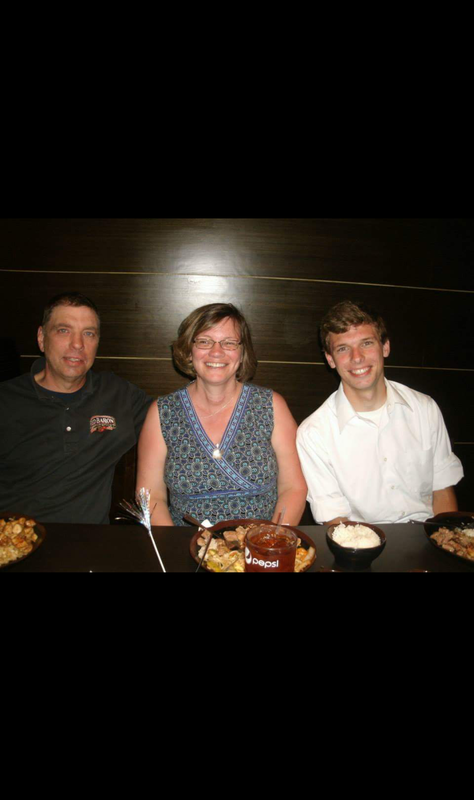 A year and a half ago, when Richard Kern was 18, he was diagnosed with malignant Melanoma. While going through treatment, his medical bills soared to exceed $100,000. Thankfully, Richard’s mom is a member of UFCW Local 1059. Because of the collective bargaining agreement UFCW Local 1059 fought for at Kroger where Mrs. Kern works, her health insurance covered a vast majority of Richard’s overwhelming medical costs. Richard can now say he is a cancer survivor. But tragedy very recently struck his family again, when his father had a stroke. Richard’s father was airlifted from his local hospital in Lacaster, Ohio, to the facilities at Ohio State University where doctors fought to keep him from having another stroke. Richard says that by fighting for workers’ rights, the union “literally kept me and my dad alive.” Help Richard spread his message, by posting on social media, shopping union-made, or simply telling a worker in your local grocery store or in your favorite retail shop thank you for their service. Together, unions and the millions of hard-working Americans they represent will continue fighting for workers’ rights and improving the quality of life for the middle class.